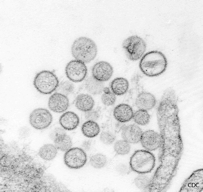 To examine the mechanisms of pathogenisity of hantaviruses, following research projects are going on. By using recombinant viral proteins, safe and rapid serotyping assay including a substitute for ordinary neutralization test are developed. Two systems have published. One is truncated N protein based ELISA system and another is envelope glycoprotein-based neutralization system of pseudotype virion.